The American decision to recognize Jerusalem as the capital of Israel is an inspired move and the Canadian government's decision to respond judiciously is very commendable. Nothing useful in the Middle East peace process has occurred in 25 years, but the correlation of forces in the region and the ambitions of the Arab powers have evolved. For decades, Israel's most fanatical enemies were Iraq, Syria and Saudi Arabia, and the first two countries have disintegrated and Saudi Arabia is now an Israeli ally with Egypt and against Iran. The Arabs dislike the Palestinians at least as much as they dislike the Jews and the Lebanese Christians — all are considered commercial elites where they have been minorities in Arab countries, and as there are no more Jews and very few Christians in Arab countries, that animosity has abated. For decades the Arab powers used the Palestinian question as a red herring to enflame the Arab masses and distract them from the chronic misgovernment the Arab rulers were inflicting on their peoples. Now, for the first time since the British relinquished Palestine, and Jordan and France vacated Lebanon and Syria, 70 years ago, there is a physical encroachment on the Arab world, from their ancient Persian enemy. The Arab Spring was nonsense — the notion that democracy can easily take hold where it has never been and no institutions exist to promote it was a fantasy worthy of George W. Bush, whose aggressive championship of democracy handed Lebanon to Hezbollah and Gaza to Hamas, and contributed to the victory of the Muslim Brotherhood in Egypt, where it had been the 900 pound gorilla in the Arab house for 75 years. (By the dumb luck of the Brotherhood's incompetence, the West dodged the bullet and the Egyptian army took back the government.) The only way forward is authoritarian government seeking economic growth and gradual social progress. This was essentially the course followed by the Shah of Iran, the most enlightened ruler Persia has had since Alexander the Great's transitory regime 23 centuries ago, and he lost control of events to mad medieval theocrats. Saudi Arabia, a state that has been a joint venture between the House of Saud and the Wahhabi radical Islamic leadership, is now modernizing and becoming a benign and more secular dictatorship, leading the resistance to Iran. The new government of Saudi Arabia has proposed to the Palestinians a settlement of its affairs with Israel less generous than the Israelis have themselves offered, and it implicitly acknowledges that Jerusalem is Israeli. 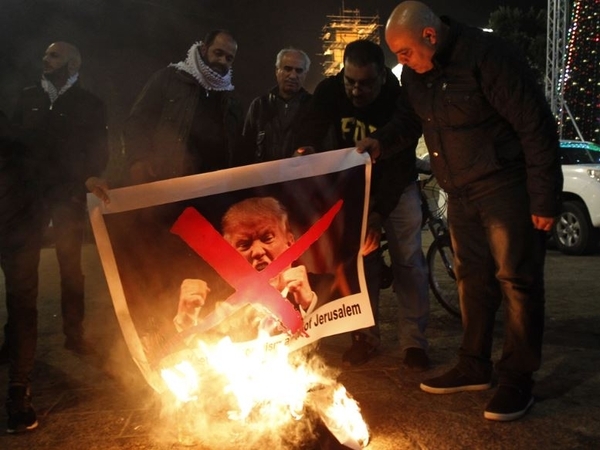 There will be no significant opposition to this move, apart from festive burnings of American flags and pictures of Donald Trump in the West Bank and Gaza. The Arab masses don't care what happens to the Palestinians or Jerusalem (and the U.S. will presumably put its embassy in an uncontested section of Western Jerusalem). The Chinese and Russians object because they consider themselves rivals to the United States and are happy when the United States is mired in Middle Eastern conflicts as a prolonged, low-key Vietnam, as it was for 13 years under George W. Bush and Barack Obama. China has no dog in that hunt, and Russia fancies it has a role to play as champion of factions in several of the fictional or failed states in the region. The Western Europeans object because they think they have a role there as former colonial powers. In fact, there has never been a West European post-Second World War policy in that region except to await the American position and then stake out something more favourable to the Arabs. We have just observed the centenary of the Balfour Declaration, which Jews, or at least Israel, have generously celebrated as the first recognition of Israel's right to a Middle Eastern homeland. In fact, and as I have had occasion to remark in the British House of Lords (I am a member of it), the British, more than any other country, created this mess by selling the same real estate to two buyers at the same time, and inciting the right to possession of both, with the professed ambition to create "a Jewish homeland" without compromising the "rights of the Palestinians." This was moonshine and Britain checked out, leaving the new Jewish state, established on the motion of Stalin's U.S.S.R. at the United Nations, seconded by President Truman's America, to fight for its life. The Jewish people effectively faced a second attempt at annihilation just three years after the liberation of the Nazi death camps. While the Arab sections of Israel have been under-served, the Arabs enjoy liberties they cannot exercise in any predominantly Arab country and have a large representation in the Israeli Knesset and full civil rights. To some extent, Israel has carried out the second part of the Balfour Declaration and observed Palestinian rights, difficult though it is when the official policy of the Palestinian leadership is the eviction or extermination of the Jews, yet again, and as so often before. It ill behooves Britain's prime minister, Theresa May, to say that President Trump has been "unhelpful." The British dalliance in the Middle East was a disaster, except for British Petroleum, and ended in the ignominy of Suez in 1956, where Lester Pearson and Louis St. Laurent, with American encouragement, did what they could to salvage any decorum for Britain and France. This recent and contemporary bunk about Israel as an apartheid state is the last gasp of the useful idiots of primeval anti-Semitism. The Jews are the majority, unlike the Afrikaaners; the Arabs have substantial rights; and Israel was not just admitted to the United Nations as a territory and jurisdiction, like Canada and the United States and other existing countries in 1945 were, but was created by the United Nations as a Jewish state. It is the ultimate, legitimate country. The agitation about Jerusalem as capital is nonsense — the Israeli Knesset and Supreme Court are there and Russia recognized Jerusalem as Israel's capital in April of this year, which makes their disapproval of Trump's move this week a bit rich, even by the unvaryingly cynical standards of the Kremlin. Prior to 1967, when the Jordanians ruled East Jerusalem and the West Bank, Jews could not pray at the Western wall, could not attend the Hebrew University at Mount Scopus or be treated at the Hadassah Hospital on Mount Scopus, which Jews had founded decades before, and they could not live in the Jewish quarter of Jerusalem, where their ancestors had lived for 200 generations. Trump has undone the shame of Obama allowing the United Nations last year to condemn Israeli possession of these sites as "a flagrant violation of international law." All has changed in the Middle East. The Palestinians no longer benefit from the patronage of the Arab leaders to keep the pot boiling with Israel — they were happy to be cannon fodder, to prevent the improvement of the wretched settler camps or the resettlement of their inhabitants, as long as it made them personally rich and world famous. They could have had a Palestinian state any time in the last 40 years if they had been prepared to recognize the right of Israel to exist as a Jewish state, its raison d'être. They preferred celebrity and violence and some of their leaders have called for a new Intifada this week; presumably, this time, the population will have the intelligence to resist the call — it's not as if the last two Intifadas were a howling success. They have been abandoned by their former patrons and Israel is geometrically stronger than it was even 20 years ago, not at all isolated, and not threatened by Iraq and Syria. The answer has been obvious since the Taba meetings in January 2001: the West bank becomes narrower and the Gaza Strip thicker and the Palestinians have a secure road between them. It isn't Israel, which is primarily for the Jews, or Jordan, which is majority Palestinian but ruled by the Bedouins and the Hashemite kings, but it is a state, and with foreign assistance, which would be plentiful, and Palestinian tenacity, which is proverbial even by local standards, it would flourish. There are 198 countries in the world — not every newly created state can expect to be a Canada, Australia, or Brazil. Donald Trump has recognized realities and done the Palestinians a favour, if they and their ancient terrorist leadership aren't too punch-drunk to recognize the facts: the Palestinians were used and are no longer useful. Donald Trump is a realist and is not overly concerned with the American Jewish vote, which is now infested with Jew-hating Jews anyway. The Palestinians should take what they can get while they can get it.